If you’re looking for a quick and easy dinner to serve this fall and winter season, this is it. Instant Pot White Cheddar Potato Soup is warm, comforting, and ready in no time. It’s perfect for busy weeknights and filled with a delicious blend of sharp white cheddar and savory potato. There’s nothing like a big bowl of homemade soup. It’s the ultimate comfort food. It’s made with basic ingredients, but packs in so much flavor. 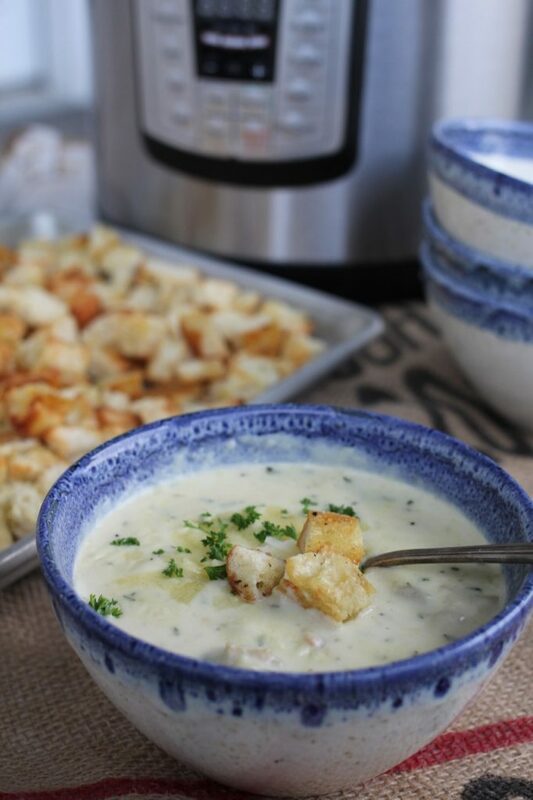 Instant Pot White Cheddar Potato Soup takes the soup game to a whole new level, with no extra effort. In just 30 minutes, you can have a delicious, thick, creamy bowl of homemade goodness. Get your spoons ready, this recipe is sure to warm you up this fall! 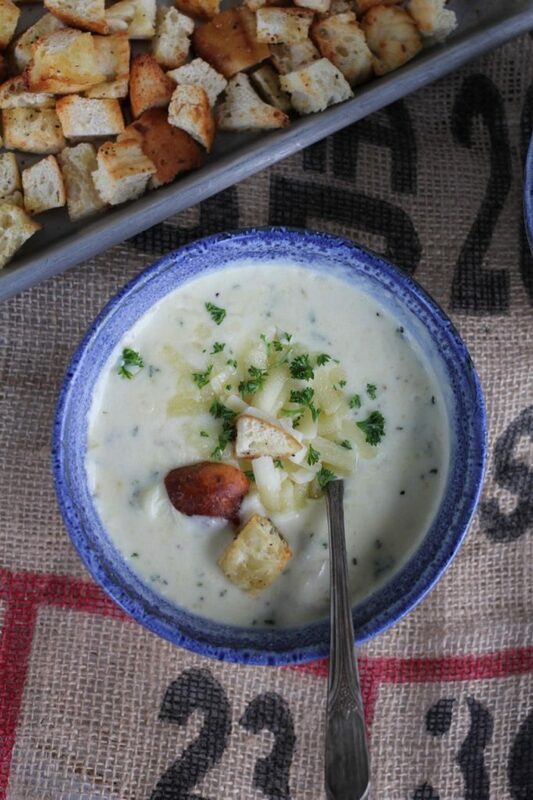 There are A LOT of potato and cheese soup recipes out there. 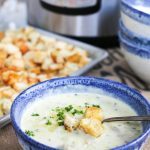 What makes Instant Pot White Cheddar Potato Soup so special? For one, it’s made in the Instant Pot. This one pot wonder is speedy, preserves the nutrients and flavor in the food, and makes almost no mess to clean up. Second, Instant Pot White Cheddar Potato Soup needs only a few ingredients: potatoes, white cheddar cheese, chicken broth, half and half, flour, and a few spices. No cream-of-anythings, just basic food staples cooked into a smooth and filling soup. All of the ingredients are most likely in your fridge/pantry! Leaves are changing, temperatures are falling, football season is under way. It’s basically Fall. The BEST time of year. There’s just something calming about simmering soup on a chilly evening. 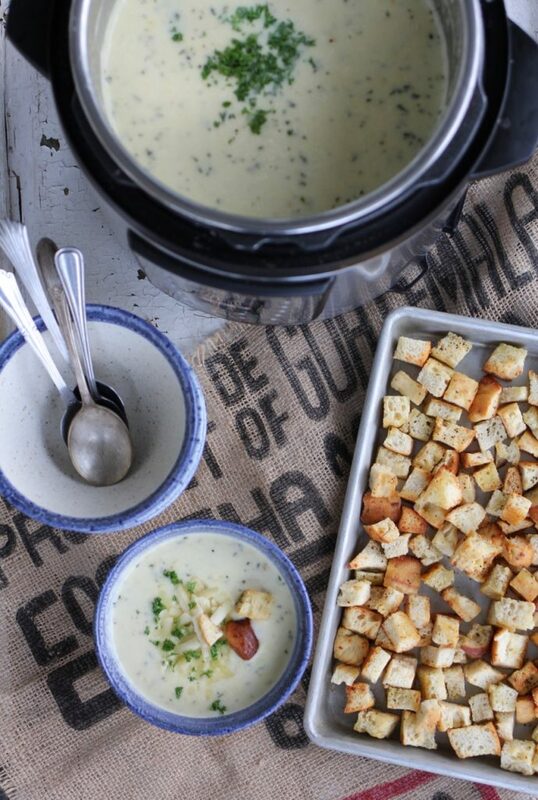 Instant Pot White Cheddar Potato Soup is the perfect way to cozy up on these kind of nights. I made this soup last year for the first time, for a neighborhood gathering. It was gone in no time! 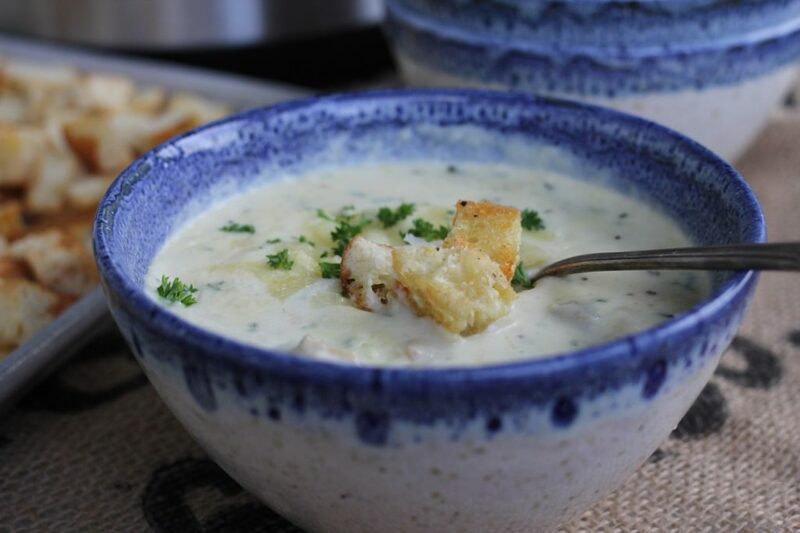 The smell of freshly cooked potato, sharp white cheddar cheese, and a warming thick, creamy base will make you want to snuggle up with this soup all season long. Let’s be real here, you can’t go wrong with a bowl of delicious homemade soup. It just makes life better. Instant Pot White Cheddar Potato Soup will be your new favorite go-to dish to make as the days get shorter, the nights get longer, and the weather cools. It’s rich, creamy, cheesy and savory heaven in a bowl. Pair it with a thick piece of bread or roll and a salad and you’ve got a filling meal that your family will love. 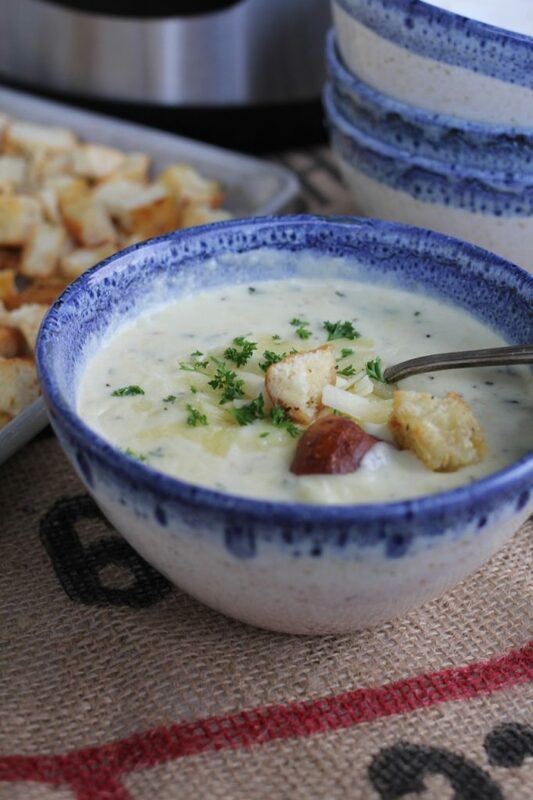 I love to serve this soup with home made croutons which I whip up while the potatoes are cooking. Simple and quick to make, filled with hearty flavors, this is comfort food at its finest. Happy Fall! If you’re looking for other Instant Pot recipes, try a few of our favorites: Instant Pot Chile Verde, Instant Pot Beef Stroganoff, Instant Pot Beef Stew, or Instant Pot Whole Rotisserie Style Chicken! ​If you're looking for a quick and easy dinner to serve this fall and winter season, this is it. Instant Pot White Cheddar Potato Soup is warm, comforting, and ready in no time. It's perfect for busy weeknights and filled with a delicious blend of sharp white cheddar and savory potato. Place potatoes and water into Instant Pot. Make sure rubber ring is in place inside of lid and the vent is set to the "sealing" position. Using the MANUAL setting, or HIGH PRESSURE setting, cook potatoes for 10 minutes. When the timer goes off, release the pressure using a manual pressure release. Remove potatoes from the Instant Pot. Peel and dice potatoes, and set aside in a bowl. Drain off any remaining water and discard. Rinse out the Instant Pot insert with water, and place back into the Instant Pot. Turn the setting to SAUTE and place butter into the Instant Pot. After the butter melts add flour, salt and pepper. Whisk the ingredients together. Whisk in half and half. Add dried onion and chicken broth. The soup will start to thicken at this point. Add cut up potatoes to the soup base and stir with a large spoon. Stir in sharp cheddar cheese and add salt and pepper to taste. If you don't have dried onion on hand, you can finely chop 1/2 cup of onion and sauté in butter on step 3 of instructions. You may also use milk in place of half and half, the soup will not be as thick, but still have great flavor. I use Russet potatoes, but you may also use white or red potatoes. I think Russets are the easiest potatoes to peel after cooking in the Instant Pot. I used Sharp White Cheddar Cheese (Tillamook brand) but you may use yellow cheddar, medium or sharp. I've also used Pepperjack Cheese in this soup for a little bit of a spicy kick. This sounds delicious! Do you think it would be good with chicken? Would you add it raw to the IP or cooked afterwards? Thanks! Hi Rebecca, that would be a great addition. You could cook the chicken before or after in the instant pot and add it to the soup. Thanks for asking! After you turn it to saute the first time so you leave it that way until the cheese is melted? yes, after using the pressure cook setting, remove the potatoes and then rinse the pot. Add the butter and flour on the saute setting and the rest of ingredients, and the cheese just until it is melted. You can then turn the saute setting off and just use the “keep warm” setting. Can I divide this in half with no problem? This might be a really dumb question, but I’m always curious because the instant pot is so new to me. Thanks! Made this last night for dinner. Our entire family LOVED it!! I think I ate 4 bowls myself!! ha ha. We served it with that yummy back-at-home sourdough bread from Costco and sprinkled some cooked bacon on top. So delicious!! I struggled with my potatoes, though (only third time I’ve fixed anything in my IP). They peeled perfectly but weren’t cooked through enough, so I ended up dumping everything on the stove to try to finish cooking the potatoes there but still had a few a little more crunchy. Still, definitely making this one again and again and again!! My potatoes didn’t cook through either and were crunchy. Any ideas? Otherwise, the soup was delicious! Hi Katy, did you use Russet potatoes? My potatoes didn’t cook through either and were crunchy. Any idea how to fix this? Otherwise, it was delicious! Could the potatoes be peeled and diced before cooking? It seems like it might be harder to do while they’re hot. And how do you think that would affect the cooking time? I am not sure how it will effect cooking time? Im guessing they will cook faster, maybe half the time? I never recommend peeling before cooking the traditional way in boiling water, because the potato takes on too much water. Let me know if you try this! Do you think cornstarch and water would work ok instead of the flour and water? I can’t have flour. Made this tonight for dinner. WE LOVED IT!! Thank you for another delicious recipe! Thanks Sherice. I love how easy it is to make this soup! I appreciate your feedback. Thanks for reading ABK! This soup is amazing and totally easy! I made this for my family and took the extra to my in laws because they were sick. The following day both my husband and daughter wanted it for lunch so I made another batch. The croutons on it are super yummy so don’t skip them. I agree, Tiffany, the croutons make all the difference. I’m so glad you enjoyed it and thanks for reading ABK! Hi Stephanie, I would cook it on high for 4-5 hours or on low for 8 hours. Hope this helps and thanks for asking! This soup was SO good! I took it to a couple of ladies who had just had new babies with a batch of dinner rolls on the side. I am always nervous to serve people meatless meals (I love them, I just know people usually expect meat in their dinners), but got some texts afterwards saying how much they enjoyed it. Thank you for this delicious and EASY meal. We will be making it over and over. I’m sure they were just grateful someone made them a yummy dinner! This recipe is definitely a keeper and perfect for the cold weather. I’m so glad you enjoyed it and thanks for sharing, Alex. I’ve made this twice now. So delicious! A quick and easy lunch or dinner. Made this today. It was my first instant pot meal. It was delicious. I, too, had issues with my russett potatoes being quite crunchy. Because of the comments I cooked them 11 minutes on high pressure. To fix the issue. I just cooked the soup on sauté extra long till they softened up. Any ideas how long I should cook them for next time? They weren’t crazy big? Also had some issues finding white cheedar cheese (I’m in sandy, Utah). Any suggestions. Walmart had it but a weird brand. It worked out though. This soup really was delicious. I can’t wait to make it again and again! Thank you.